The severity of the injury ie how painful it is. If you are unable to walk without pain then yes running is likely to make it worse. Irritability: If you start running and have pain immediately, which, then lasts for several hours after or is much worse the next day, it is likely that you may require a short period of rest. Pathology: Injuries that involve bone stress or bony type injuries tend not to do so well if you continue to run with pain. These type of injuries often do require a period of rest. Impact: Can you tolerate impact? Can you jump and land on two feet or hop repetitively without symptoms? Response to running: Your bodies response to running will give us the clues as to whether you can keep running whilst recovering from injury or pain. Stage of the season: If you are training for a specific event such as a marathon it may not be appropriate to rest completely from running but modifications to running will help. How Will I know If I Can Continue Running? Example 1: You start running with some mild pain but within 5 minutes of the run this pain has eased to virtually nothing and you are able to continue running. At 4 miles the pain starts to return and by mile 5 it is too sore to run. However, post run the pain has settled within a couple of hours and by the next day there is no significant reaction. This type of response would indicate that the injury can tolerate some running but if you were to keep running 5 miles or more you are likely to make the injury worse. In this instance, we may use mileage as a guide and allow the runner to run somewhere between 3-4 miles. Example 2: You find that pain only comes on if doing hilly or high-intensity work, but running steady or on the flat you are relatively ok. Taking a break from the hilly and high intensity running for a couple of weeks may allow symptoms to settle. Then you can gradually re-introduce the higher intensity work and be guided by the response. Example 3: You start running but within less than 5 minutes you get pain and after 10 minutes the pain is too severe to continue running. This may well require a short period of rest depending on the injury. Addressing any areas of weakness with a strength programme. Addressing restriction of joints and muscles with a flexibility and stretching programme. Addressing any training errors – too much intensity, too many miles, high-frequency low recovery. Modifications to help keep you running? Reduce the overall volume. Reducing the total mileage done each week. The continuous loading when running can be the issue, so, introducing periods of rest during the run. E.g. walk 1-2 minutes after every 1 mile. Perhaps changing the time of day you run. Some injuries like tendinopathies can feel more stiff and sore in the morning so running later in the day may be less painful. Reducing the speed, or reducing up and downhill work depending on the response of your pain to these activities. You may require some running form re-education to modify the impact of running. This ideally will be guided by a professional in this area who can reason whether your running gait may contribute to your injury. Surface: Changing to running on trails can vary the terrain and is more multidirectional, which, may reduce the continuous loading you get from running on the road or treadmill. Shoes – perhaps it’s time you changed your running shoes. Old shoes, even if they have done low mileage, the shock absorption material degrades over time and you may need to change them. The guide below is one that I use to help people return to activity safely or help them stay running. It is adapted from the research by Silbernagel (2007). They tested 2 groups of runners with achilles tendon pain, one group ran using the guide below and the other group rested. The group who continued some form of running did better than the group who rested. Ideally you want to keep symptoms at or below 3/10 with no latent adverse reaction. Note: This guide is not suitable for all injuries, and as mentioned before bony injuries tend to take longer to recover from if you run on with pain. 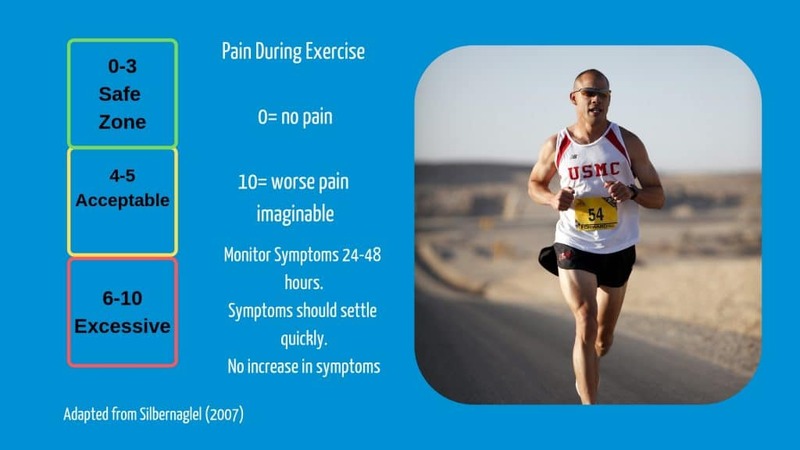 It may also not be appropriate if you are running with a 3-4/10 pain for weeks on end without a change or reduction in symptoms. What Can I Do If I Can’t Run? Sometimes, we have to accept that in order for the injury to get better we have to stop running. However, this doesn’t mean we sit on our backsides catching up on the latest box sets. Cross training: You may be able to mirror the volume of your runs with some form of cross training – bike, cross trainer, rowing maching etc. You are aiming to simulate your run training with cross training as long as the symptoms don’t increase. This will keep up a certain level of fitness and will also help our mental health. As many of you know sometimes we use running as our stress buster to lifes demands. Strength and Conditioning: Make sure you address any weakness that may have contributed to your injury and also addressing the injured area as this will now have lost some strength and condition. Tissues adapt and become stronger if they are loaded. You may find this is where you need the help of a sports or running specialist physiotherapist to guide on this. Again there is no right or wrong answer to this and it may come from some trial and error. It is not a one size fits all approach. Low Risk: You may start very gradually with a run walk programme and build very slowly. Although very low risk in terms or re-injury it may be less rewarding. Higher risk: You start with a higher volume of running and monitor symptoms. More risky in terms of re-injury or flare up but more rewarding in terms of getting back more quickly. Another option is to work out a baseline of what the body can tolerate and build from there onwards. Impact response: Firstly you may wish to test yourself on impact. Starting with jumping and landing on two feet repetitively then moving onto hoping repetitively. Observe your response to the impact. Perhaps do a short run walk test – eg 2-3 mins run 1 min walk x 3: and again observe the response. Setting a Baseline: Run at a comfortable pace until any symptoms come on then take around about 10% from this figure. This is your starting figure as your baseline. For example, if symptoms occur at 5km then your longest run maybe 4.5km. 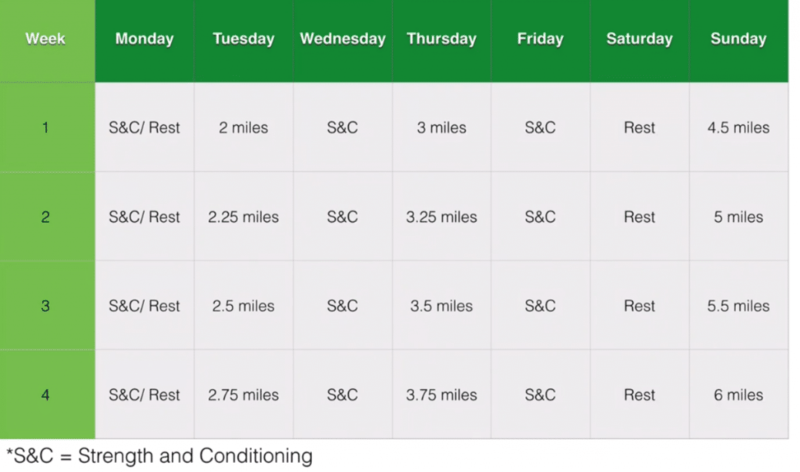 Below is an example of how you might then plan and build up your return to running. Thanks to Tom Goom “running repairs” for this picture www.running-physio.com. Use apps like couch to 5km with take you gradually through a programme of a few weeks building up to tolerating around about 30 minutes of running. It is generally better if you can keep running to some degree. Modifications to your run training can often allow you to continue to run. Making sure you include some strength and conditioning as part of your plan. If you can’t run, aim to mirror your running with some form of cross training. Use the traffic light system to help guide your return to running. Remember some injuries will require rest. IF IN DOUBT GET IT CHECKED OUT. I specialise in running injuries and gait re-education so if you are concerned or would like to see me about an injury please contact me at the clinic. Telephone 01283 716559, email: info@birdge38physiotherapy.co.uk or Book online here.